A lot of the people that contact us are looking for ways to become the next national investigation player. We always advice against it, especially if they’re struggling to keep their doors open as a home ran business. There is enough money and business opportunities for investigators at a local level. It does take time and they must engage their community, but the opportunity is there. Joining the local chamber of commerce is a great place to start. The membership accomplishes several different things: Your name gets out there, you establish your name as the “authority” in your field, you open up your doors to the main players in the community, and you instantly make connections to the business owners and representatives in your community. 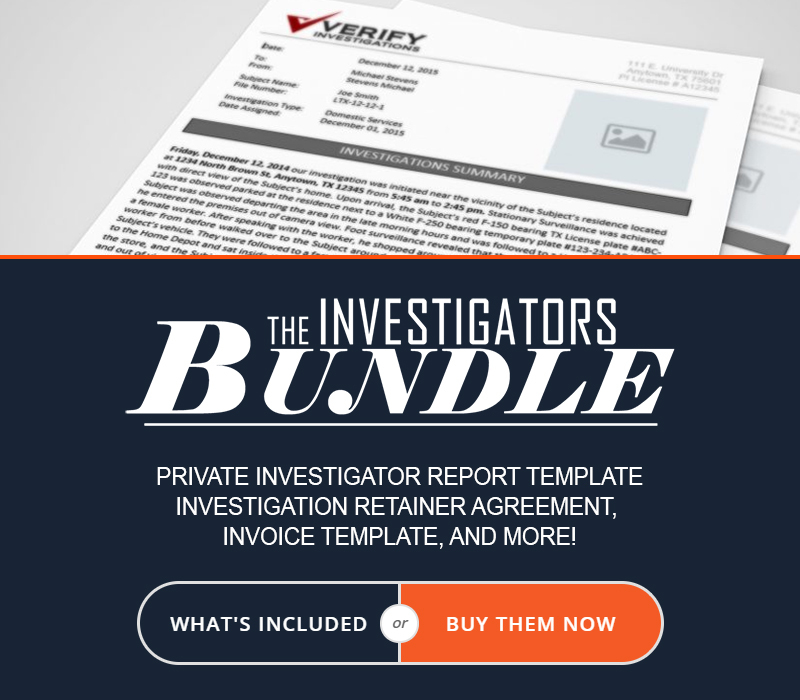 If you’re looking to build B2B Relationships – Corporate Investigations, Background Checks, Pre-Employment investigations, Risk Management Services, Workers Compensation Investigations, etc. The Chamber of Commerce is where you want to be. What is the Chamber of Commerce? The chamber of commerce is a group that’s dedicated to protecting and promoting the local business community. The primary goal? To help business owners network and grow. When you sign up for the chamber, you typically get 2-3 minutes in front of the community to talk about the services that you offer, your history, where you came from, and what you’re planning on bringing to the community. During that time, you can sell your services to every small business in the audience. – My name is Bill, I’m a licensed private investigator and specialize in corporate investigations to include pre-employment checks, risk mitigation services, security audits, employee theft, and surveillance. That’s a very simple introduction, but you get the idea that I’m trying to go for here. The best thing about it is that the chamber hosts different events across the community. Events that puts you in the front of all the business owners in your particular community. They host network events, family outings, business planning seminars, and you’re even able to host your own seminar to teach the community on safety or even teach business owners on ways to minimize a particular risk (Employee Theft as an example). In 2012 the ACCE conducted a study and found that 49% of the people were more likely to think favorably of a chamber member and up to 80% of the people were more likely to purchase goods or services from the company in the future. People trust the chamber, and that trust gets passed down to the members. When we joined the chamber and needed office space, we got recommendations on who to use (other chamber members). When we needed new office equipment? We got another member. Phone systems? Another member for that too. We’re now looking for a home and again we’re working with a member. Likewise, when people need our services, we get recommendations from everyone in the group. If you join the Chamber of Commerce, Rotary Club, Lions Club International, Kiwanis, or many others, you’re joining a group/club full of people that encourage networking and business growth from within the group. If you’re successful, you’ll stay with the club and increase their revenue and possibly bring on new members to the club. It’s a “You scratch my back I scratch yours” type deal. Yes, that’s cool. But I need to make a living. There is no need for you to grow to a national level to make a reasonable living. We work with a female investigator in the South West, she’s a member of the Chamber of Commerce. 75% of her work comes from chamber members. This includes attorneys, corporations, and small businesses (along with domestic work from time to time). She established herself over the last 3 years as being the go to investigator for small businesses and attorneys in the city. Her average income: $120,000. Her firm’s size: 3 people. Herself as the lead investigator, a part time translator/transcriptor, and a general office worker. When I first spoke with her, she was very proud of being the local investigator and turned that into her brand. “Your Local *Redacted* Private Investigator”. She doesn’t know everything, but she knows to how to find the people that do. A lot of her work is actual investigative work, the rest is consultation. Hal Humphreys once wrote an article in which he said (Talking about a spy) He’s the guy who knows a guy, and that makes him look smart. Stop worrying about being all things to all people and start using your resources. As private investigators, we’re problem solvers. I don’t care if you’re the head of a National Conglomerate or the authority in Small Ville, TN. Be proud of your stature, build your brand, and offer your clients the services they deserve. I promise you, people will actively seek you for the services that you offer, not for the size of your company.